If you like to break away from tradition when it comes to interior design, why not ditch the Douglas Fir and add some festive sparkle to your home with an alternative Christmas tree this December. We’ve shopped around and browsed through creative ideas on Pinterest to find some great alternative trees that will suit different home décor themes and lifestyles. This sustainable wooden Christmas tree is made from redwood sourced in Sweden and Finland, making it the perfect addition to a Scandinavian inspired living space. Child friendly and easy to assemble, there’s also no pesky pine needles to clear up! We could see a tree like this looking great in this Scandi style home interior from our Camaro Loc, featuring White Limed Oak luxury vinyl tile flooring. We also used a similar tree one with our Designatex flooring. This tree shaped steel marquee light is ideal for adding a subtle festive touch to a modern, urban home. Sturdy enough to last years and no extra decorations required, it can be kept on a shelf to out of reach from kids and pets. This tree would be the ideal complement to an industrial themed living space like this look featuring Aged Metalstone flooring from our Camaro range below. A traditional kitchen with a country feel doesn’t need to be paired with a Christmas tree featuring lots of greenery. We love this tree which looks like a stack of different sized branches accessorized with oversized baubles and decorations. The slightly random and imperfect look of this rustic tree makes it ideal for spaces like the warm and cosy kitchen below which features Camaro North American Walnut luxury vinyl tiles. 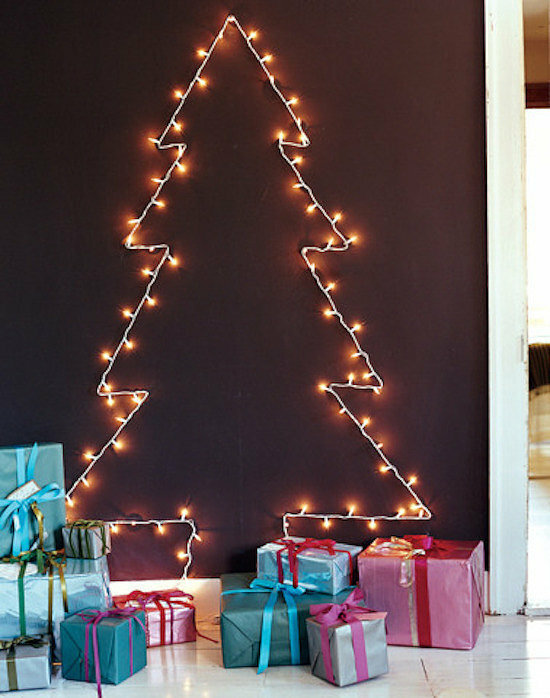 Untangling the fairy lights can be a tricky job, so a sparkling pre-lit Christmas tree can be a less frustrating option. This 6 foot tall eye-catching birch tree would fit right in to the minimalist monochrome look below from our Colonia brochure, turning it into a winter wonderland. You could add a few low-key decorations or keep it simple by leaving the branches bare. Those who live in a small apartment or flat will know that space is precious and you may not have the luxury of enough storage room for a tree and decorations during the rest of the year. So if you have limited space, little time and a tight budget why not create a Christmas tree outline using fairy lights (see below) for a simple yet effective festive feel. 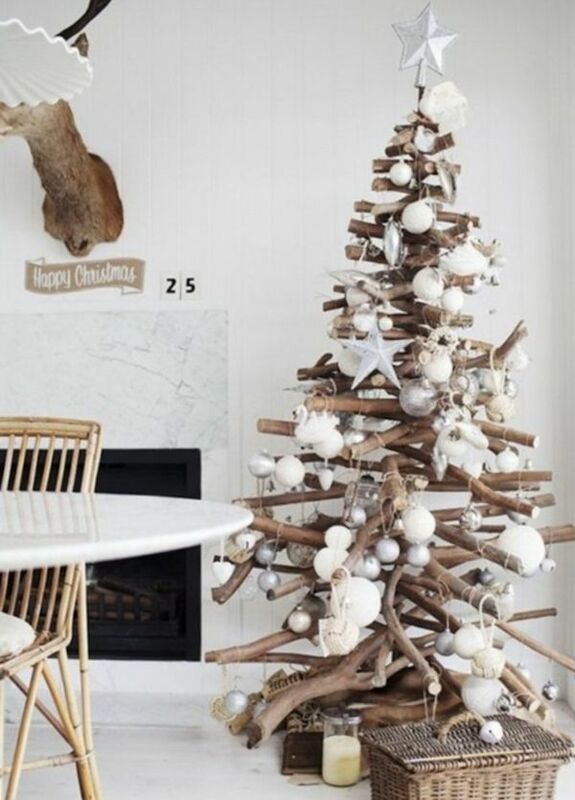 Remember to take a look at Pinterest for plenty more DIY Christmas tree ideas like this one. This modern tree shaped cabinet is a great, no-fuss way of displaying your Christmas cards or festive ornaments without taking up too much space. The cabinet includes three separate shelves which you can stack into a Christmas tree shape or use individually throughout the year. Another space saving idea is using a funky wall sticker like this removable and reusable one from Not On The High Street. This piece of wall art will be a great talking point for when you’re entertaining friends or family over Christmas. We hope that has given you some inspiration on how to give your home a festive touch this December. For more home interior ideas don’t forget to browse through our new Polyflor at Home website or follow us on Twitter where we are counting down the days to Christmas with our very own advent calendar.